A-HOTEL.com - Luxury and cheap accommodation in Stallupönen, Russia. 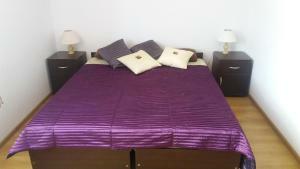 Prices and hotel, apartment booking in Stallupönen and surrounding. Situated in Vilkaviškis, Širvintos viešbutis offers air-conditioned rooms with free WiFi. Boasting a 24-hour front desk, this property also provides guests with a restaurant. Set within 23 km of Lithuanian Open Air in Punsk in Szypliszki, Trzecie Jezioro offers accommodation with free WiFi. All units include a fully equipped kitchen, allowing guests to prepare their own meals. Located in Smolniki, Willa Hańcza has a garden and terrace. All rooms boast a kitchenette and a private bathroom. Located in Suwałki Landscape Park, on the shore of Hańcza Lake and offering a public beach area, Nocleg nad Jeziorem Hańcza - B.Danowska offers rooms with free WiFi access.